Aloe vera works wonders to get relief from prickly heat rashes.Simply apply some aloe vera gel on affected areas to soothe redness and inflammation.The anti-inflammatory properties of aloe vera help a lot to relief prickly heat rashes. Take 1 tablespoon of sandalwood powder, 1 tablespoon of coriander seeds (dhania) powder and add some rosewater or cold water to make a paste. Mix them well and apply on prickly heat rashes. Let it stay for 30 minutes and then take cold-water bath. This is one of the best natural home remedy to cure prickly heat rashes. Take 3-5 tablespoons of Fuller's earth(multani mitti) and add some cold water to make a paste. Now apply this paste of affected areas and wash off with cold water when it dries off. Cucumbers are famous for their and soothing effects. You can eat cucumber or directly apply cucumber paste on affected areas to get relief from prickly heat rashes. Take some neem leaves and make a thick paste by grinding with cold water. Apply this paste on affected areas. Let it stay for 30 minutes and the wash with cold water. Anti-bacterial properties of neem help a a lot to cure prickly heat rashes caused by infections. Take 1 tablespoon of baking soda and mix into one cup of cold water.Now soak a clean washcloth into this solution and apply on the affected areas. Let it stay for 3-5 minutes and again soak this cloth in mixture of baking soda and apply on affected areas. Repeat this for at least for half an hour. For best results repeat this process 3-4 times a day. For quick relief from burning sensation you can simply rub an ice cube on affected areas. Alternatively, you can soak a clean and soft cloth in ice cold water and apply this on affected areas for 2-3 times a day. Take a raw potato and remove the peel. Slice up the potato and apply these thin slices on the affected areas. Gently rub these slices on the affected areas. It will give you the quick relief from the itchy and prickly sensation. Oatmeal bath is also very helpful to get rid of prickly heat rashes. Add about one cup of oatmeal into the bath tub filled with cold water and stir it well. Soak yourself in it for 15 to 20 minutes. Now use the oatmeal to gently scrub the affected areas. It will help to exfoliate the skin and clear the blocked sweat ducts. For best results, repeat this on a daily basis. Take some watermelon, remove the seeds and make a pulp. Apply the pulp on your affected areas for quick relief. Drinking juice of watermelon is also very helpful in getting rid of prickly heat rashes. (i) Avoid scratching because this may introduce germs into the deeper layers of the skin that may worsen the condition. (ii) Avoid hot and humid environment and try to stay in cool environment. (iii) Try to wear loose and light weight cotton clothes and let the sweat evaporate easily. (iv) Drink plenty of water during hot weather. Try to eat fruits and vegetables rich in water contents.Cucumber, celery, beetroot, carrots, apples and watermelon are good food choices. 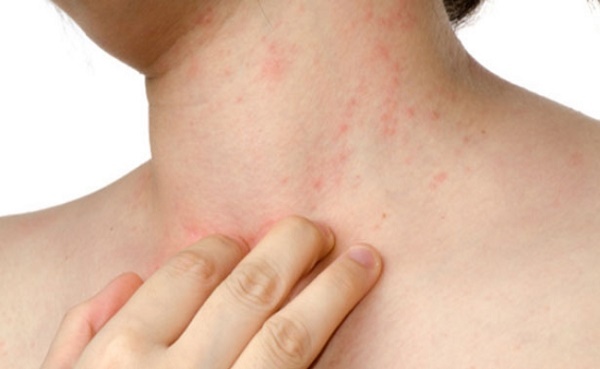 (v) Usually prickly heat rash disappears within a week using above natural home remedies. However, if you don't get relief within a week or if some kind of skin infection develops, you must consult your problem with a medical doctor.